The Swiss are good for many things: cocoa, watches, army knives... but perhaps the most useful innovation to come from the land of hole-y cheese is fondue. With post-nor'easter Boston closely resembling the Swiss Alps, it's high time you dug into the melty cheese-and-chocolate tradition at these seven spots. Anthem’s rustic American menu affers a four-cheese fondue (because three cheeses would be uncouth). Dunk some toasted ciabatta in the secret blend and taste the cheesy rainbow. For optimal decadence, spring for the buttery lobster. 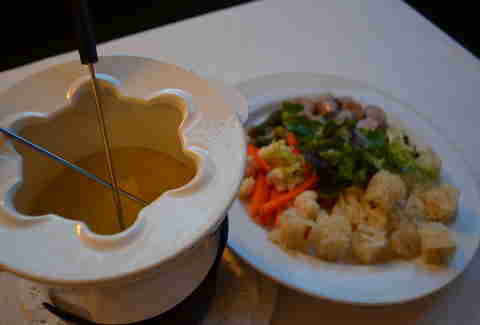 Fondue Sundays are back at Beacon Hill Bistro, and their tiny forks await your arrival. Available during dinner (5:30-10pm) with reservations recommended, BHB’s French-style fondue mixes Bergkäse Alpenblumen, Emmantaler, and Gruyère Vieux cheeses with Domaine Giachino Abymes wine for maximum authenticity. It’s served with the traditional accoutrement of bread, small boiled potatoes, and cornichons. 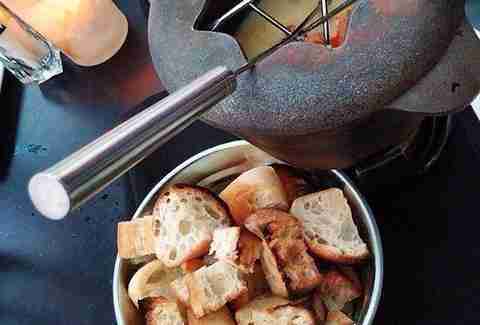 Since wine and cheese are BFFs, it’s no wonder that this vino venue has top-notch fondue. Belly’s cheese selections (curated by sister store Central Bottle) form the base of Fondue for 2, a veritable sea of liquid gold. Go all Jacques Cousteau and submerge apples, Brussels, cauliflower, and Iggy’s Francese while sipping your favorite adult grape juice. 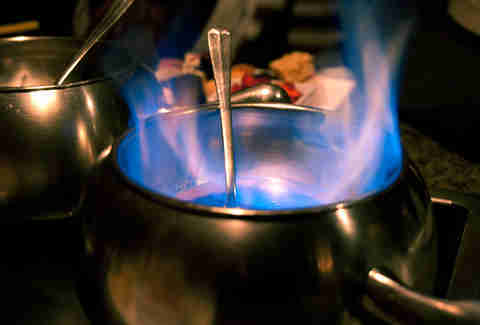 For a limited time only, Chef Joshua Lewin stirs up a mighty fondue during Bread & Salt’s culinary “incubation” at Wink & Nod. Gruyère and Comté unite with garlic, shallots, white wine, and herbes de Provence to create this classic belly-warmer. 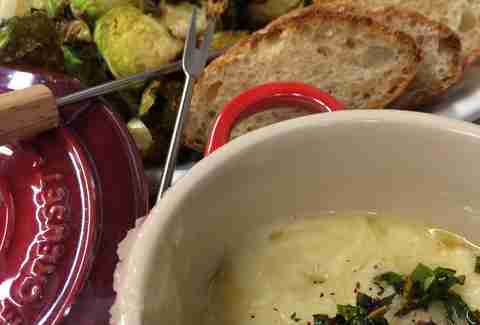 The cornucopia of dippers includes house-baked sourdough, pickled cauliflower, blanched broccoli, and fried Brussels sprouts. Bonus: pair this up with some daily charcuterie for an extra $8. 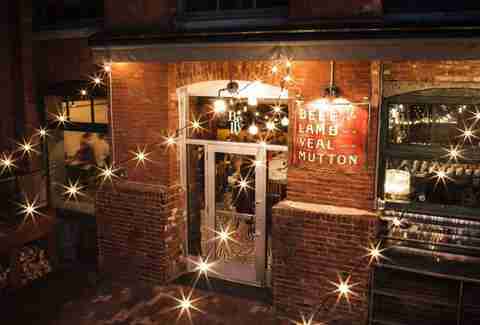 The Bald Man knows chocolate and the molten offerings at his Back Bay outpost are outstanding. Chocolate Fondue Towers, with flavors like Crystal Churros and Urban S’Mores, will dominate your table’s skyline amid fields of fruits, marshmallows, and Tutti Frutti Waffles. You'll want to get your hands on The Fantastic I-Scream Bar Fondue, a DIY toolkit for building your own choco-coated ice cream treats. It’s like Candy Land, but for reals. So. Much. Fondue. 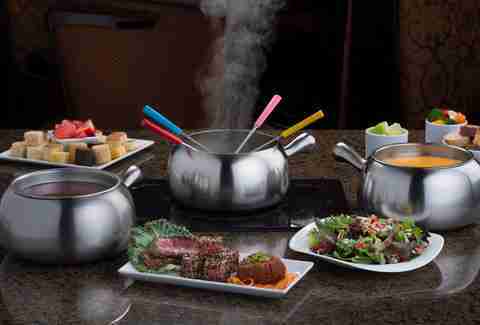 From apps to dessert, The Melting Pot’s bottomless bacchanal includes just about everything. Start off with a Wisconsin cheese trio, and then choose three proteins (e.g., filet) for a unique dinner dubbed “Fondue By You.” Finish things off with the Flaming Turtle, a rich crowd-pleaser with milk chocolate, caramel, and candied pecans. 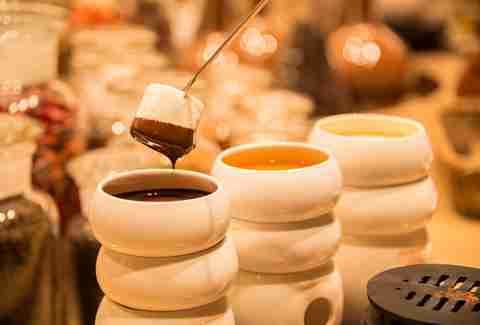 Temple Bar has two fondues and both are must-get masterpieces of melted glory. In the appetizers department, the earthy apple cider and cheddar fondue will make you dream of Wisconsin. 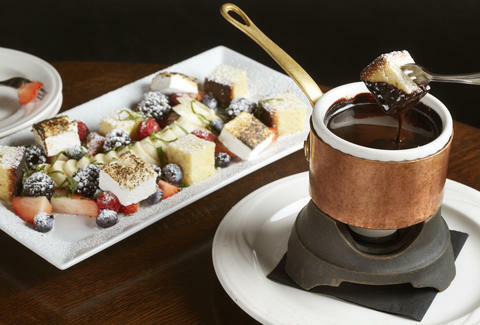 And for dessert, seasonal fruits, pound cake, and marshmallows go swimming in a little copper kettle of silky chocolate fondue."